Like the other two germ layers, mesoderm and endoderm, the ectoderm forms shortly after the egg is fertilized, and rapid cell division initiates. 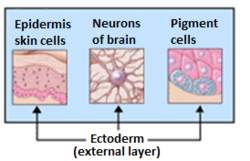 The epidermis of the skin originates from the less dorsal ectoderm which surrounds the neuroectoderm at the early gastrula stage of embryonic development . The position of the ectoderm relative to the other germ layers of the embryo is governed by "selective affinity", meaning that the inner surface of the ectoderm has a strong (positive) affinity for the mesoderm, and a weak (negative) affinity for the endoderm layer . This selective affinity changes during different stages of development. The strength of the attraction between two surfaces of two germ layers is determined by the amount and type of cadherin molecules present on the cells' surface. For example, the expression of N-cadherin is crucial to maintaining separation of precursor neural cells from precursor epithelial cells. The ectoderm is instructed to become the nervous system by the notochord, which is typically positioned above it. During the process of gastrulation, a special type of cells called bottle cells invaginates a hole on the surface of the blastula which is called the dorsal lip of the blastopore. Once this lip has been established, the bottle cells will extend inward and migrate along the inner wall of the blastula known as the roof of the blastocoel. The once superficial cells of the animal pole are destined to become the cells of the middle germ layer called the mesoderm. Through the process of radial extension, cells of the animal pole that were once several layers thick divide to form a thin layer. At the same time, when this thin layer of dividing cells reaches the dorsal lip of the blastopore, another process occurs termed convergent extension. During convergent extension, cells that approach the lip intercalate mediolaterally, in such a way that cells are pulled over the lip and inside the embryo. These two processes allow for the prospective mesoderm cells to be placed between the ectoderm and the endoderm. Once convergent extension and radial intercalation are underway, the rest of the vegetal pole, which will become endoderm cells, is completely engulfed by the prospective ectoderm, as these top cells undergo epiboly, where the ectoderm cells divide in a way to form one layer. This creates a uniform embryo composed of the three germ layers in their respective positions. ^ a b c d e f g Gilbert, Scott F. Developmental Biology. 9th ed. Sunderland, MA: Sinauer Associates, 2010: 333-370. Print. ^ Baer KE von (1986) In: Oppenheimer J (ed.) and Schneider H (transl. ), Autobiography of Dr. Karl Ernst von Baer. Canton, MA: Science History Publications. ^ O'Rahilly, R; Müller, F (1994). "Neurulation in the normal human embryo". Ciba Found Symp. 181: 70–82. PMID 8005032. ^ Pispa, J; Thesleff, I (Oct 15, 2003). "Mechanisms of ectodermal organogenesis". Developmental Biology. 262 (2): 195–205. doi:10.1016/S0012-1606(03)00325-7. PMID 14550785. ^ a b Tai, Y. Y.; Chen, R. S.; Lin, Y.; Ling, T. Y.; Chen, M. H. (2012). "FGF-9 accelerates epithelial invagination for ectodermal organogenesis in real time bioengineered organ manipulation". Cell Communication and Signaling. 10 (1): 34. doi:10.1186/1478-811X-10-34. PMC 3515343. PMID 23176204. ^ Priolo, M.; Laganà, C (September 2001). 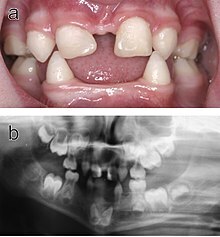 "Ectodermal Dysplasias: A New Clinical-Genetic Classification". Journal of Medical Genetics. 38 (9): 579–585. doi:10.1136/jmg.38.9.579. PMC 1734928. PMID 11546825. ^ Clarke, A.; Phillips, D. I.; Brown, R.; Harper, P. S. (1987). "Clinical Aspects of X-linked Hypohidrotic Ectodermal Dysplasia". Archives of Disease in Childhood. 62 (10): 989–96. doi:10.1136/adc.62.10.989. PMC 1778691. ^ Bayes, M.; Hartung, A. J.; Ezer, S.; Pispa, J.; Thesleff, I.; Srivastava, A. K.; Kere, J. (1998). "The Anhidrotic Ectodermal Dysplasia Gene (EDA) Undergoes Alternative Splicing and Encodes Ectodysplasin-A with Deletion Mutations in Collagenous Repeats". Human Molecular Genetics. 7 (11): 1661–1669. doi:10.1093/hmg/7.11.1661. PMID 9736768.